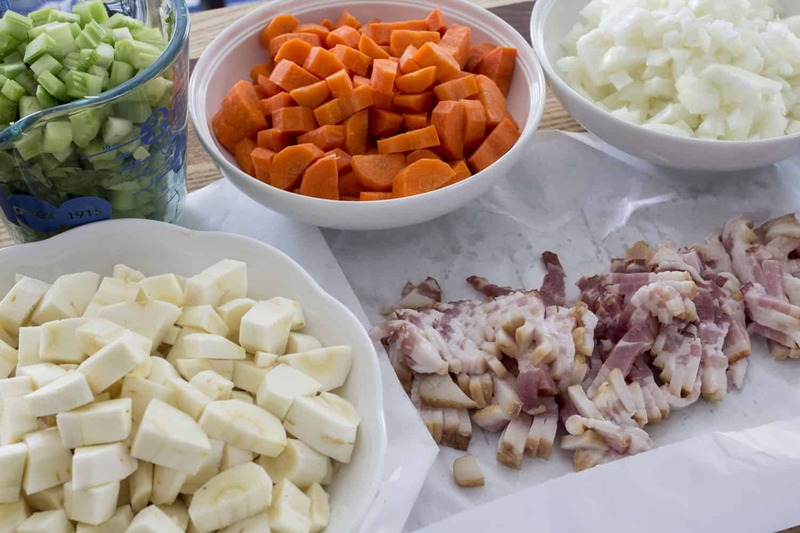 Mise en place is a french cooking term meaning “in its place.” Practically, it means chop all the veggies, get out all the ingredients, and prep all the things BEFORE you start cooking. Thinking back to my childhood and baking with my mom, I know she told me to get everything out before starting to mix. I can vividly see her reading down the recipe with me, teaching me how to bake cookies. That teaching moment must not have sunk in too far because I graduated from college and started cooking on my own in a very different way. Time was always lacking so I thought I could “save time” by prepping as I cooked. Take ham and vegetable soup for example. First, I would chop the onion and let that saute while I chopped the rest of the vegetables for the soup. The onions would burn in the time it took to chop carrots, celery, and potatoes. No big deal (or so I thought), toss a little more oil in the plan along with the vegetables, and let those cook a bit while I chop up the ham. Oops, over cooked the vegetables, now they are too mushy. Oh well, toss that ham in along with the chicken stock. Oh, I need to add a thickener, usually corn starch and water or flour and water (pre-Paleo days!). Where is that corn starch…??? Found it! Mix it up. Add it to the soup. Serve it up for dinner and…the ham is dried out because I cooked that step too long as well while I searched for the corn starch. So many mistakes. So many mediocre meals that could have been avoided by just prepping my ingredients first. I figure I’m not the only one out there trying to prep and cook at the same time, so I thought I’d share how I cook now using mise en place. Cutting up all the vegetables/meat/fruit for our meals is by far the longest single piece of prep work for our meals. I cut up all the ingredients that will be cooked, no matter their order of being used and put them in individual bowls. The bowls I use most often are the regular cereal-type bowls from our everyday dishes and clear glass custard cups. Larger amounts of veggies go in the bowls (the white ones pictured above) like chopped carrots, sweet potato, or brussel sprouts. Then I put smaller amounts into the glass custard dishes, like garlic, ginger, or shallots. Keep a large bowl (or bowls, in my case!) right next to your cutting board to collect the peels, husks, paper, and all other organic matter that you aren’t going to be cooking. I’ve found having this bowl right next to me speeds up my prep work. I peel root vegetables right into the bowl: sweet potatoes, turnips, parsnips, etc. As I chop other vegetables, I toss the unwanted ends in as I go: onions, celery, beets, etc. If you don’t have a compost bin/container, just toss the entire contents in the trash once you are finished. You will still be more efficient at the cutting board with this trash bowl close by even if you don’t compost! Put all the vegetables used at each stage of the recipe in the same bowl. So if you are making soup, after the onions and garlic are sauteed, usually all the firm, starchy vegetables are added at the same time. Save a little bit of time (and dishes!) by putting all these vegetables into the same bowl so they can be added to the pot in one pour. 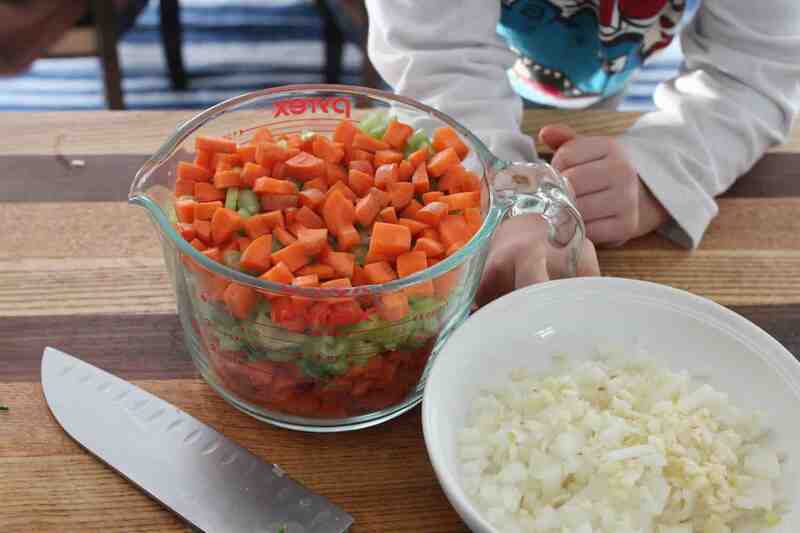 In the picture above, sweet potato, celery, and carrots are combined in the large glass measuring cup and garlic and onions are in the white bowl. At this time, also add any spices to the appropriate vegetable bowls according to the directions in the recipe. 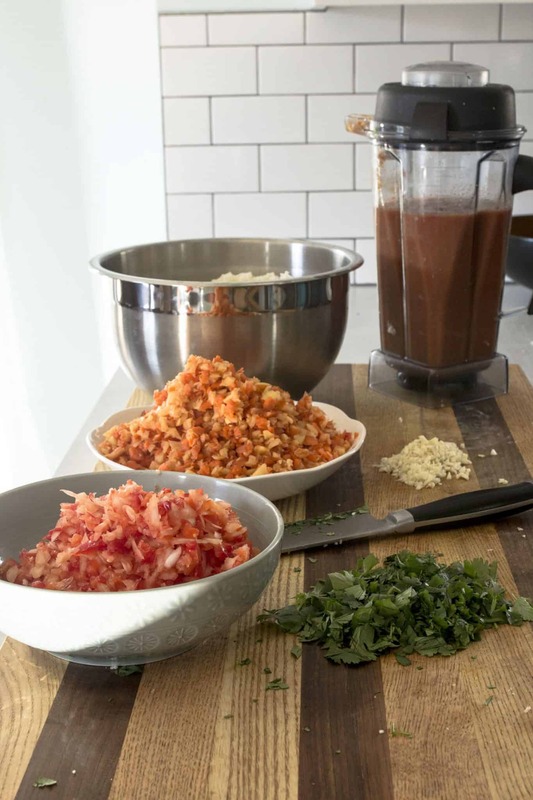 A common grouping in my Mexican recipes is minced garlic along with cumin, oregano, and chili powder. After mincing the garlic, I put it in a glass custard bowl. Then I scoop the cumin, oregano, and chili powder right on top of the garlic. Not only is this easier than pouring 4 separate bowls into the pan (Also much faster than measuring the spices from the container into the pan! ), it saves precious time as garlic and dry spices bloom in about 30 seconds. Time is precious at these steps! Particularly when cooking complex recipes (I’m looking at you America’s Test Kitchen! Delicious but many more steps than average! ), it is helpful to line up the bowls in the order you will need them. It just takes a bit more of the guess work out when you are in the thick of cooking. This step also prevents me from mixing up my recipes if I’ve got two or more going at the same time. I line up the items for each recipe on either side of my stove so I don’t get confused. Prep even the garnishes or leafy greens that get wilted at the very end of the recipe. Don’t tell yourself you’ll have time while ____ is cooking. That time is better served cleaning up, if that time exists at all. I usually find there is zero extra time once I get rolling cooking. So prep everything at the beginning, before starting any cooking. 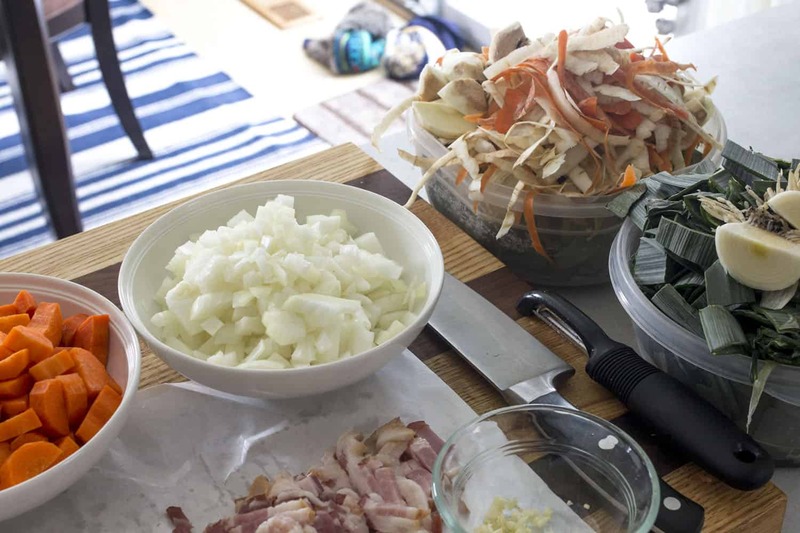 Mise en place might cause you to balk because of the extra dishes it requires. Discipline yourself to pour the ingredient into the pan and immediately put the dish in the dishwasher. This step is as much a practical step as a mind game. Yes, it gives a head start on the meal clean-up, but it also leaves less visual clutter on the counters which makes my brain more energized to clean up. It feels like there much less to do, which may or may not be true! Mise en place takes some practice and discipline. Don’t fool yourself, like I tried to for many years, that you can keep up chopping and cooking. You can’t! This practice will let you cook with less stress and have a better tasting food because you won’t be over-cooking any steps as you prep the next one. Bring on the tastier food! Mise en place! I’m curious, do you prep your ingredients before you start cooking? Do you see this method as helpful? 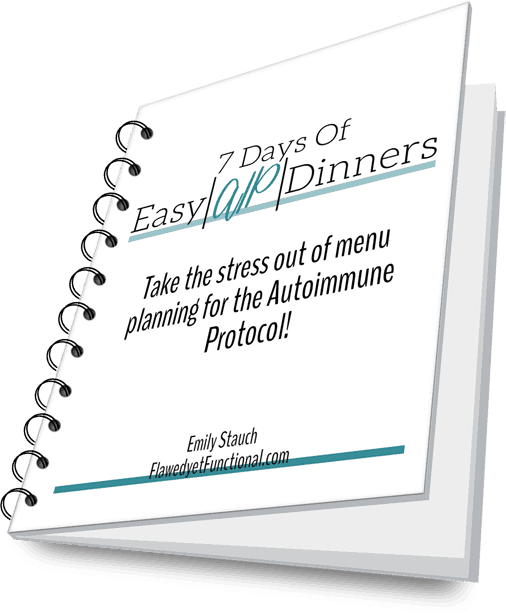 Would you be less stressed preparing dinner if you had all the ingredients lined up, ready to go?